Long before the food cart craze hit Vancouver, the gourmet food truck, where one could find mobile restaurant quality food, was already in existence elsewhere. I had already encountered something similar in San Francisco, where Spencer on the Go was offering gourmet French food. It's been on the Food Network, so it definitely has a following. 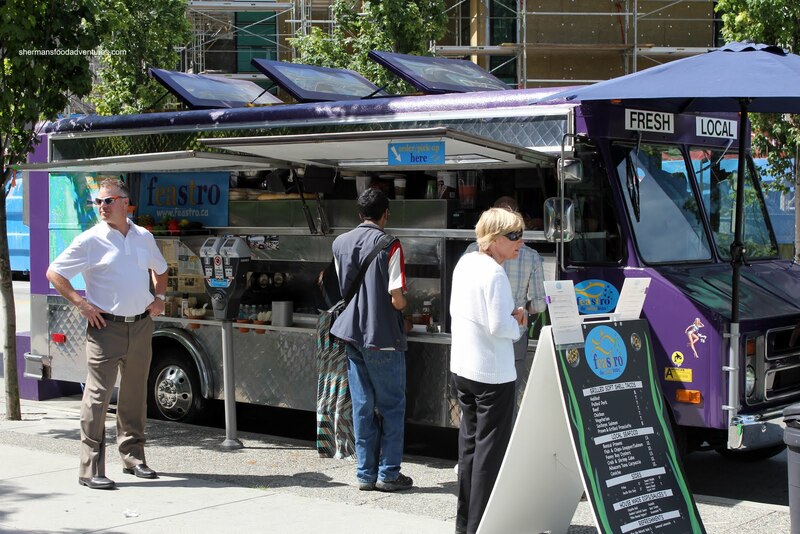 Now, we have Feastro the Rolling Bistro direct from Sunshine Coast. Setting up its new digs on Thurlow at Cordova, it strives to offer up gourmet food from a catering truck. 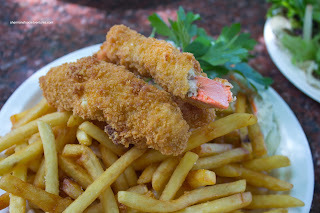 It is definitely different than most of the other Vancouver street food offerings since it isn't exactly cheap, but the quality of ingredients are high. With that in mind, I went for Steve's Famous Seafood Chowder which was a rich and creamy concoction consisting of fresh shrimp, scallops, salmon, tuna and oysters served with grilled baguette. 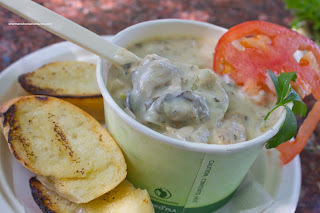 The bowl of chowder was so thick with cream and fresh seafood that I could literally stick the spoon in the middle and it would not ever tip over. The thick chowder benefited from the ingredients and had a sweet seafood essence further heightened by plump corn and dill. Although it was not cheap, it was certainly worth the money. I actually didn't hog the whole chowder to myself. I ended up sharing that and a plate of Salmon and Chips with Viv. The salmon was moist and sweet with a crunchy breading that was not greasy. However, the fries were completely oil-logged and not visually appealing. It didn't go down well either. I'm thinking that this may have been a one-off (should've gotten the yam fries instead). Love the subtle tartar sauce though. Of course we couldn't visit Feastro without one of their tacos. Okay, lemme get this straight first - the tacos here are their twist on the Mexican specialty. Don't expect Al Pastor, Carnitas or my personal favourite, Lengua here. No need to flame them though, they are not a Mexican taco truck and never claim to be. With that in mind, the most interesting one we came across was the Prawn & Grilled Prosciutto Taco. And as the name implies, it consists of the aforementioned ingredients accompanied by organic greens, sour cream, salsa and crispy green onions. 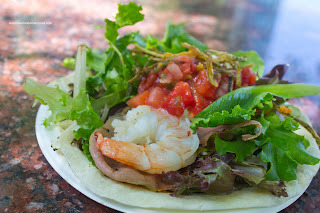 I thought the taco was quite pleasant with a nice sweet snap from the prawns and the saltiness from the prosciutto. Despite the appearance of a soft taco, the whole thing held together as we ate it. Marshmallow decided to go for 2 different tacos, which was a relief for me! 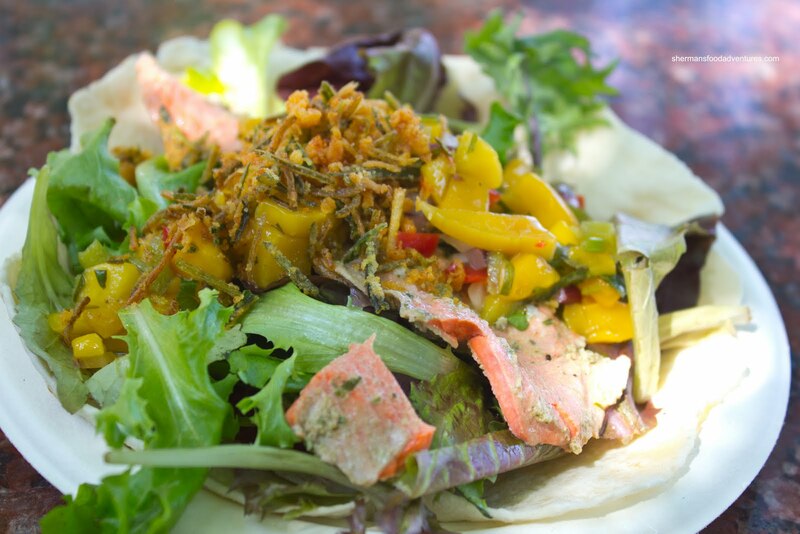 Her first was the Sockeye Salmon Taco on a bed of mesclun greens and topped with mango salsa and crispy green onions. She remarked that the salmon was moist and flaky which was complimented by the sweet salsa. A light and refreshing taco. However, I really couldn't get how little actual fish there was in this $8.00 taco. 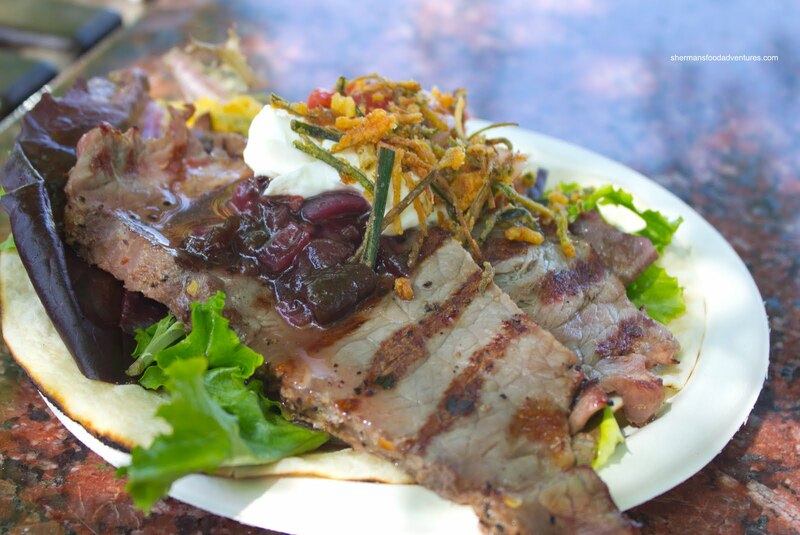 Lastly, her son had the Steak Taco, also on a bed of greens topped with some type of onion marmalade, sour cream and crispy green onions. The boy was sure hungry and attacked it like a neanderthal. Well, it was for the better since the meat was slightly chewy. Other than a grunt of "good", I wasn't sure of the final verdict. However, for the items we did try, they were quite good (fries withstanding). In fact, I can see why they are the "rolling bistro". The food is a cut-above most other cart offerings. With that though, there are higher prices. But I guess you do get what you pay for.